The Thai that binds our cultures at Folkmoot 2018 will be the Lampang Kalayanee School bringing its traditional and beautiful ancient folk dance to the Smoky Mountains! Colorful, graceful and to many westerners, exotic, folk dance from Thailand is sure to be a big hit with festival goers all over Western North Carolina in July. Folkmoot 2018 opens July 19 and runs through July 29 and will feature performing dance troupes from Ghana, Italy, Czech Republic, Mexico, Venezuela and Northern Cyprus in addition to our troupe from Thailand as well as Anglo Appalachian and Cherokee dancers and musicians. You can see them all, featured together and with videos, on our Folkmoot Performers of 2018 page. And see a special YouTube performance of the Lampang Kalaynee troupe below! The Lampang Kalayanee School is found in the city of Amphoe Muang, in the Lampang province of Thailand, approximately 96 kilometres from Chiang Mai Province. Kalaynee enrolls 3,602 students in its lower and upper secondary schools with a faculty of 153. It is one of the biggest and most famous secondary schools in the North of Thailand. Programs available for upper secondary school students include science-math, English-math, English-social studies, English-French, accounting, Arts, Pottery, Chinese-English, Japanese-English, and computer-English. It is a co-educational school which is famous for Thai dance. The group performs live music and is notable for its northern folk dance and classical Thai dance. It has danced in international festivals since 1997 in such diverse nations as Australia, Russia, Taiwan, France, Turkey, the Netherlands, Germany and England. ระบำเทพบันเทิง(RABAM THEPBANTHEONG-Dance of Angle) is the dance of the celestial attendant of the Great Ancestor in the episode of the “Hurricane”, from the court dance I-nao which was staged at the Silpakorn Theatre in 1956. จตุภาคภิรมย์(JATUPARKPIROM-Dance of the 4 Regions) is a local dancing art with graceful dancing manners, music dialect and different dressing which beautifully differ from each region of Thailand. The folk dance starts with the manners and dressing of people in the North that shows the gentle grace and dancing art of girls in the local tune of the Northern folk song which is tender and sweet. Then, it is followed by the Southern dancing art, which is the local ballet dance of Thai Muslim with the beautiful and tender dancing grace and waving fans in two hands along with the fine tune. After that it is the Isan dancing art, “Serng” – a kind of Isan dance, which is a quick and fun dance along the beautiful tune with vigorous, fun and stimulating rhythm. And it ends with the Central dancing art, which reflects the culture and ways of life in farming of people in the Central Region, where people usually play for fun cheerfully after their harvest by dancing in tune merrily. 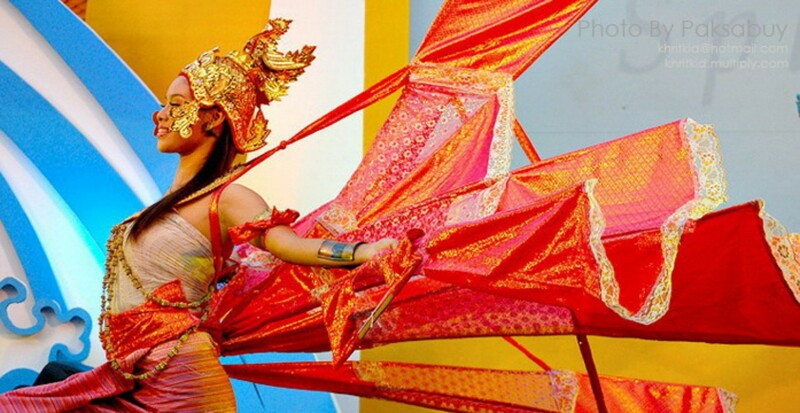 :มโนราห์บูชายัญห์ (MANOHRA DANCE OF SACRIFICE BY FIRE) is a solo dance from the story called Prince Suthon and Manohra. Manohra is a half bird – half woman creature. She is the wife of Prince Suthon. While the prince is engaging in a war, the unscrupulous court advisors mislead the king to believe that he is in a desperately ill situation. The only means to eradicate the evil spell is by sacrificing his daughter-in-law, Manohra, by fire. The ceremony for sacrifice by fire is thus prepared. Manohra pretends to accept the sacrifice, but offers to delight the king with a farewell dance, which will not be perfect without her wings and tail which were original taken from her. When her demand is fulfilled, she dances for a while, then flies away to her homeland, Mount Krailart. :ฟ้อนขันดอก (FON KHAN DOK- FLOWER DANCE) Fon Khan Dok is a performance showing the spectacular insight of the gentle, tender and beautiful dancing posture of the Northern women carrying a flower tray in hands and sprinkling the flowers while dancing along with the sweet folk music. This performance reflects the unique of Lanna style. :ระบำชาวเขา (RABUM CHAO KHAO (HILL TRIBE DANCE) Chao Khao or hill tribes are the minority communities who live along the hills in the northern part of Thailand. They have their own customs and culture. Both foreigners and Thais are interested in their dancing which reflects their happiness and joy.